As usual, the Global Warmers have used their religious zeal to attach causality for a natural disaster to “Global Warming”. The two are quite unconnected and even less connected to anything done by humans. Because of all the history of prior, much larger, droughts. The relentless, weather-gone-crazy type of heat that has blistered the United States, Canada and other parts of the world in recent years is so rare it can’t be anything but man-made global warming, according to a new statistical analysis from a top American scientist. The research by a man often called the “godfather of global warming” says that, from the 1950s through the 1980s, the likelihood of such sweltering temperatures occurring was rarer than 1 in 300. Now, the odds are closer to 1 in 10, according to the study by James Hansen. The NASA scientist says that statistically, what’s happening is not random or normal, but pure and simple climate change. So I went looking for a history of flow rate in the Mississippi as a decent indicator of aggregate precipitation in the entire drainage basin. I didn’t find it. Instead I found something I liked more. A much longer series. I’m going to just load up a set of graphs from those articles in one sweeping series here along with selected text quotes. I think that gives the sense of it better than piecemeal one article at a time or needing to click back and forth. Looking at the “Colorado Plains” red line you can see the dustbowl spike down, though the 1950’s look to have been worse in the Southwest of New Mexico (green line). I also just have to note that here they are using tree rings to measure water, not temperature. So a wag would have to ask “Which is it?” but I’m much more confident that they found trees in places that are sensitive to water. (The text described some of the locations and it does look like water is the limiting factor). A gridded network of tree-ring reconstructions of Palmer Drought Severity Index (PDSI) for the last 300 years has been used to create a set of maps of the spatial pattern of PDSI for each year, back to AD 1700. This set of maps enables an assessment of the droughts of the 20th century compared to droughts for the past 300 years. An inspection of the maps shows that droughts similar to the 1950s, in terms of duration and spatial extent, occurred once or twice a century for the past three centuries (for example, during the 1860s, 1820s, 1730s). However, there has not been another drought as extensive and prolonged as the 1930s drought in the past 300 years. Longer records show strong evidence for a drought that appears to have been more severe in some areas of central North America than anything we have experienced in the 20th century, including the 1930s drought. Tree-ring records from around North America document episodes of severe drought during the last half of the 16th century. Drought is reconstructed as far east as Jamestown, Virginia, where tree rings reflect several extended periods of drought that coincided with the disappearance of the Roanoke Colonists, and difficult times for the Jamestown colony. These droughts were extremely severe and lasted for three to six years, a long time for such severe drought conditions to persist in this region of North America. So we get a couple of ’50s like droughts per century. Gee… on in the ’50s and one 1/2 century later is, er, absolutely normal.. and the ’30s drought is the ‘unprecedented’ one in recent history. But what about earlier? Here we see a 2000 year perspective. What does it show? That recent droughts, even the ’30s megadrought, are not very big and certainly not “unprecedented”. Even the 1550’s era megadrought is a piker compared to the first 1000 years or so. Per the reasoning of Hasen et. al. we’d have to conclude that there was “unprecedented global warming” from 0 A.D. to 1200 A.D. then followed massive Global Cooling. 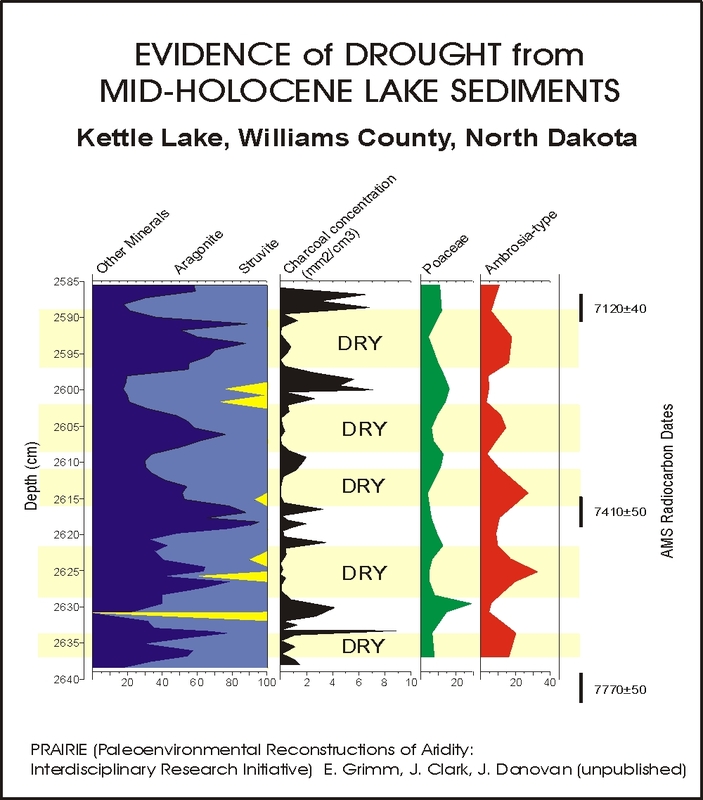 Fluctuations in lake salinity records, inferred from fossil diatom assemblages, were reconstructed for Moon Lake, North Dakota. Different kinds of diatoms favor more or less saline conditions, so an analysis of the types of diatoms found in the layers of lake sediment can be used to reconstruct variations in salinity. The changes in salinity are a reflection of drought variability in this region over the last 2000 years. The sediments were sampled at an average interval of 5.3 years, and radiocarbon and lead- 210 dates provided age control. The gap in the record from the early 17th to the early 18th century is due to loss of data from the core drying out. One of the notable features about this paleodrought proxy is the abrupt shift in the data about A.D. 1200. This record raises the possibility that different, relatively stable drought “states” or “modes” may have existed over the past 2,000 years. The graph on the right shows a marked shift between high and low salinity conditions around A.D. 1200, suggesting a change in general drought characteristics about this time. Before A.D. 1200, this record indicates regular and persistent droughts, specifically pronounced during the years of A.D. 200-370, A.D. 700-850, and A.D. 1000-1200. In sharp contrast with the period prior to ca. A.D. 1200, the current mode of drought appears relatively wet and free of truly severe drought. 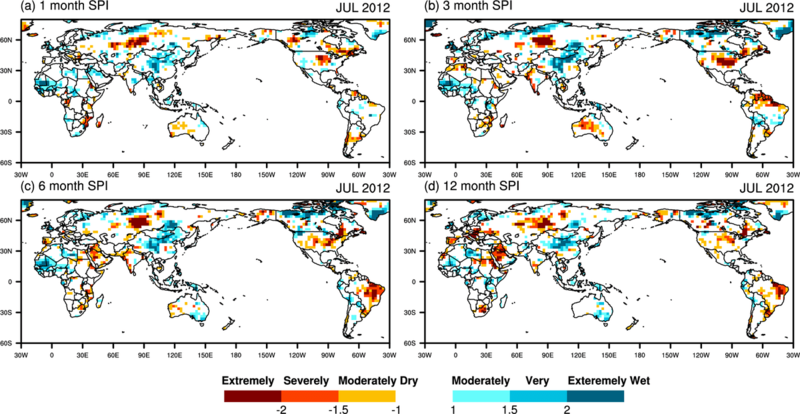 These research results suggest that the current mode of drought variability encompassing the modern instrumental record is not representative of the full range of drought variability displayed in this record. It is important to note that similar lake sediment records for this part of the northern Great Plains do not all reflect the shift in variability at AD 1200, so additional investigations are needed to confirm such a shift. The mechanisms for major shifts in drought variability in the past are not understood, and currently, there is no explanation of a climatic process that could lead to a mode change. So any large drought now, even one vastly longer and stronger could simply be a return to the ‘regime’ of the past. A regime change driven by things we do not understand and don’t know. Our present drought is absolutely normal, and frankly relatively wet when compared to even just 1000 years ago. Extraordinarily long-lived trees have been found growing in the El Malpais volcanic field of west-central New Mexico. Although it seems incongruous to find long-lived trees growing in the seemingly harsh environment of these relatively recent (3,000-115,000 years) lava fields, there are good reasons why these trees exist in this area. The lava flows have created kipukas (isolated areas of original substrate and vegetation surrounded by more recent lava flows) that have escaped disturbances such as fire, grazing, logging, and agricultural practices, because of their isolation. The lava field also appears to trap and retain moisture in this otherwise arid environment, creating a habitat favorable to tree growth. The oldest living tree found at this site is a 1274-year old Douglas-fir, the oldest known tree of this species in North America. Samples from this and other old trees were augmented with subfossil wood, from logs and remnants of living trees, to generate a 2129-year tree-ring chronology extending back to 136 BC. Not only are the El Malpais trees old, but they are sensitive to precipitation and thus, excellent recorders of past rainfall. 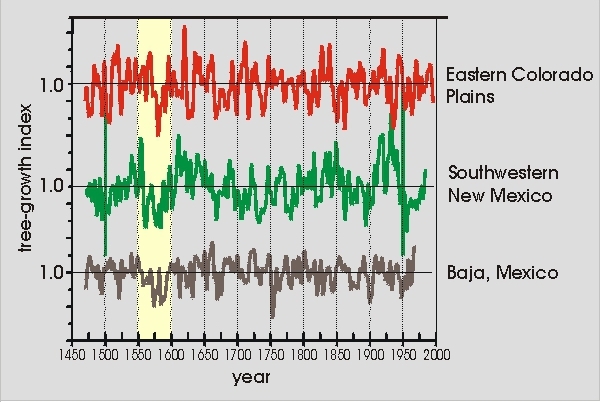 The chronology was used to reconstruct annual precipitation for northwestern New Mexico for the past two millennia, as shown in the graph on this page (the units are standard deviation from the mean). The top graph shows the reconstruction for the years 1700-1992. The 1950s drought was the most severe drought 20th century drought in this region, but when viewed in the context of the past three centuries, it appears to be a fairly typical drought. However, when the 1950s drought is compared to droughts for the entire reconstruction, back to 136 BC (bottom graph), it is clear that the 1950s drought is minor relative to many past droughts. A number of the severe droughts of the past spanned several decades, the most recent occurring in the second half of the 16th century. It’s pretty clear from this graph that from about 1800 on has generally been a very abnormally wet period, and fairly consistently so. It is that wetness that is “unusual”, not the present drought. 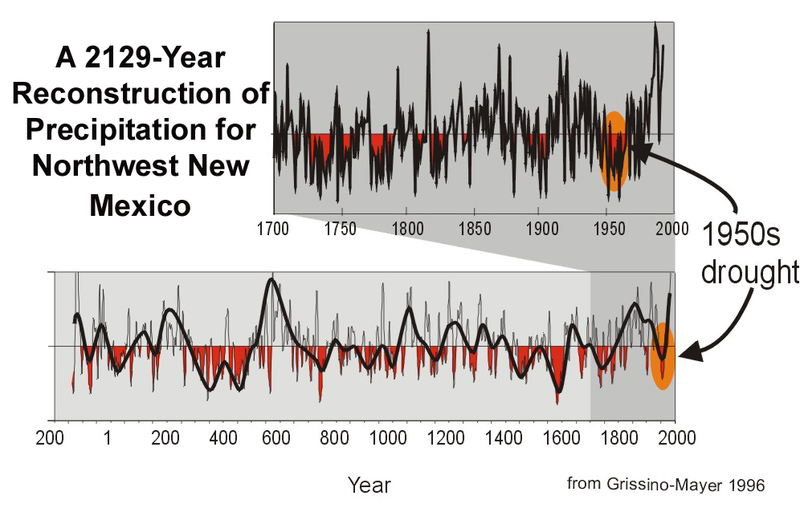 Even the extreme New Mexico drought of the ’50s is small in comparison to the prior 2000 years; being substantially the same as the “normal” from 800 A.D. to 1400 A.D.
We can now also use these two as ‘bookends’ for the geography. Not some ‘local thing’ at all, but prolonged dryer times reaching from New Mexico to Moon Lake North Dakota. In this study, 7979 years of annual (July-June) precipitation were reconstructed from bristlecone pine in the White Mountains of eastern California. The graph to the right shows a comparison between the instrumental (in blue) and reconstructed (in red) precipitation records. The reconstruction documents the occurrence of eight multi-decadal droughts, with the two most recent centered on A.D. 924 and A.D. 1299. The graph below shows the record since AD 1. The occurrence of these two droughts is validated by an independent lake-level record from the neighboring Sierra Nevada Mountains. The timing of coinciding low lake levels from the Mono Lake record (Stine 1994) is shown by the yellow bars. Droughts of this character, were they to occur today, would clearly have a devastating impact. Future work will focus on expanding the multi-millennial record of drought from tree rings and determining forcing mechanisms for these droughts. Moving down to the Mayan area, we find a ‘megadrought’ too. This graph is in years B.P. Before Present. So about 800 A.D. or 1200 B.P. they had a great drought, right on top of that long dry period in the USA. Originating in the Yucatan Peninsula, the ancient Maya civilization occupied a vast area of Mesoamerica between the time period of 2600 BC and 1200 AD. Constructing thousands of architectural structures and developing sophisticated concepts surrounding the disciplines of astronomy and mathematics, the Maya civilization rose to a cultural florescence between the years of 600 to 800 AD. Although this prosperity reigned for nearly two centuries, the Maya civilization met with misfortune between the years of 800 and 900 AD. During this time period, known by archaeologists as the Classic Collapse of the Maya civilization, many southern cities were abandoned and most cultural activities ceased. The Maya, never able to regain their cultural or geographical prominence, were assimilated into other Mesoamerican civilizations until the time of the Spanish Conquest in 1530 AD. The cause of the collapse of the Classic Maya civilization represents one of the great archaeological mysteries of our time, and has been debated by scholars for nearly a century. Some scientists theorize that the paleoclimate of the region was not only different than the present day climate, but the natural climate variability of the past could have included a period of intense drought that occurred in conjunction with the Classic Maya Collapse. Scientists reconstructed the past climate of the Maya civilization by studying lake sediment cores in the Yucatan Peninsula. In closed basin lakes, the ratio of 18O to 16O in lake water is controlled mainly by the balance between evaporation and precipitation. The 18O to 16O ratio of lake water is recorded by aquatic organisms, such as gastropods and ostracods that precipitate shells of calcium carbonate (CaCO3). Scientists can measure the 18O to 16O ratio in fossil shells in sediment cores to reconstruct changes in evaporation/precipitation through time, thus inferring climate change. Looking even deeper back in time, we find a pattern of repeating longer term swings from wet to dry. Changes in types of pollen found in lake sediment layers provide information about hydroclimatic (i.e., both climatic and hydrologic) variability in central North America during the mid-Holocene (~ 8,000-6,000 years ago). Pollen analyses from lakes in the northern Great Plains suggest a mid-Holocene shift from grasslands to vegetation dominated by weedy annuals, whereas charcoal evidence indicates persistent decade-to-century scale drought cycles at this time (Grimm et al. 1999). The diagram to the right shows the changes in grass (Poaceae, in green) and weedy annuals (Ambrosia-type, in red) in the mid-Holocene for Kettle Lake, North Dakota. When weedy annuals are more prevalent, relative to grasses, episodic droughts are indicated. This diagram also shows charcoal found in the lake sediments, which is a sign of fire. In the Great Plains, higher fire frequency occurred under wet conditions when more fuel, needed by fire, was produced. A lack of fire, and a decrease in charcoal, correspond to drier conditions. The far lefthand columns show changes in minerals in the sediments which correspond to wetter (aragonite) and drier (other minerals) conditions. Taken together, the greater relative amounts of weedy annual pollens, and smaller amounts of charcoal and aragonite define periods of drought (indicated by horizontal yellow bars). So looks to me like they are saying the graph covers about 650 years. There are 4.5 drought cycles. I make that about 144 years each, but it could easily reach the 179 year solar cycle range. Looking at the Struvite peaks, it look like they would make it a roughly 350-400 year cycle. Rather like that sub-period of Bond Events that we saw reflected in other data. ( 1500 / 750 / 375 periods and sub-periods showing up in historical events). At the subcontinental scale, relationships between modern climate and pollen were used to reconstruct the climate of the past from fossil pollen. Past distribution of fossil pollen have been used to generate estimates of past climate conditions in eastern North America (Webb et al. 1998.) One such map of eastern North America (shown to the right) indicates regional increases and decreases in annual precipitation 6,000 years ago, relative to today’s conditions. The southeastern United States was up to 20% wetter than it is today, but much drier conditions prevailed from the Great Lakes to the Northeast, and from central Canada south to Louisiana. Accompanying these decreases in precipitation was an increase of 1 to 2 degree centigrade in mean July temperature in central North America. How about up in Minnesota? The distribution of the vegetation present in Minnesota today reflects both north-south and east-west climate gradients (figure to the right), and identifies this as an important region for studies of past drought and climate variability. Lakes sediments from Elk Lake, in the headwaters region of the Upper Mississippi Basin (northeastern Minnesota), record variations in climate and other environmental factors over time scales of years to millennia. Elk Lake sediments are layered in varves, which make it possible to reconstruct information on climate variability with annual resolution. Sediment cores taken from the lake bottom have been used to generate a regional record of aridity based on the chemical, sedimentological, and biological characteristics of the sediments. Changes in varve thickness as well as the abundances of wind-blown quartz-rich silt and clay (quartz values increase under dry conditions), or the sodium from plagioclase feldspar (under dry conditions, retained in soil until washed or blown into lakes) are indicative of regionally wet and dry conditions. Increases in the remains of the diatom Aulacoseira indicate windy conditions, commonly accompanying increased aridity. The Elk Lake record, spanning almost 11,000 years, shows that conditions were warmer, drier, and windier between 8000 and 6000 year ago as inferred from increases in varve thickness, sage pollen, quartz abundance, sodium levels, and the diatom Aulacoseira (figure to the right). Similar changes in the sediment composition between 4800 and 4300 years ago are indicative of another interval of dry conditions. The subsequent decrease in varve thickness, sage pollen, quartz abundance, sodium levels, and Aulacoseira, reflects an overall trend to moister conditions from 4000 to 1000 years ago. High amplitude changes in sediment composition over the last 1500 years are also interpreted to reflect a number of shorter but equally severe intervals of dry conditions (see Dean, 1997 for details on this work). Golly… So it was HOTTER and DRYER 6-8 thousand years ago (ending of the 8.2 Kiloyear event) than now… Again 4300-4800 years ago. Gee, almost like it was a 4000 ish year cycle. ( 1500 x 3 = 4500 so perhaps supercycles of the Bond Event period?) Then we’ve got 4000 years of getting cooler and more wet to about 1000 years ago (and we saw above that the last 1000 years has been even wetter with less total drought tendency). Overall this just confirms what we’ve seen in other geologic contexts. The exit from the last Ice Age Glacial had ‘overshoot’ to the hot side about 6000 years B.P. and we’ve been on a generally cooling trend since. It is not exceptionally hot now. It is barely getting close to what it was during the prior warm cycles ( MWP, Roman Warm Period, etc.) when civilization flourished. We are still in a long term cooling trend and we have not warmed as much as prior cycles. Next turn is down, to the cold side, and it will go further and colder than in the last 8000 years or so. This drought is not exceptional. Heck, it isn’t even notable on a 2000 year scale and is substantially nothing in a 10,000 year context. It doesn’t even rise to the level of the 1930s. The semi-arid Great Plains is covered by >100,000 km2 of eolian (wind blown) deposits which contain evidence for episodes of dune formation, or reactivation of old dunes, over the past 10,000 years. The region of multiple sand dunes and eolian deposits across the central United States (figure on this page) is currently stabilized by vegetation. However, analyses of sediments within sand dunes (stratigraphic records) and the shapes of the dunes (geomorphic records) provide information about multiple past droughts, which resulted in the removal of vegetation, and the movement and accumulation of eolian sand. Accumulations of eolian sediment and formation of dunes occurs when there is adequate sediment supply, when winds exceed the speed needed to move particles of sand, and when there is a lack of stabilizing vegetation or landforms. On the Great Plains, there is adequate sediment supply. Wind strength is already sufficient in much of the Great Plains to move silt and sand, and create widespread active dunes. When a decrease in moisture results in a reduction of vegetation cover below a threshold (~30% decrease in rainfall), dunes can once again become active. 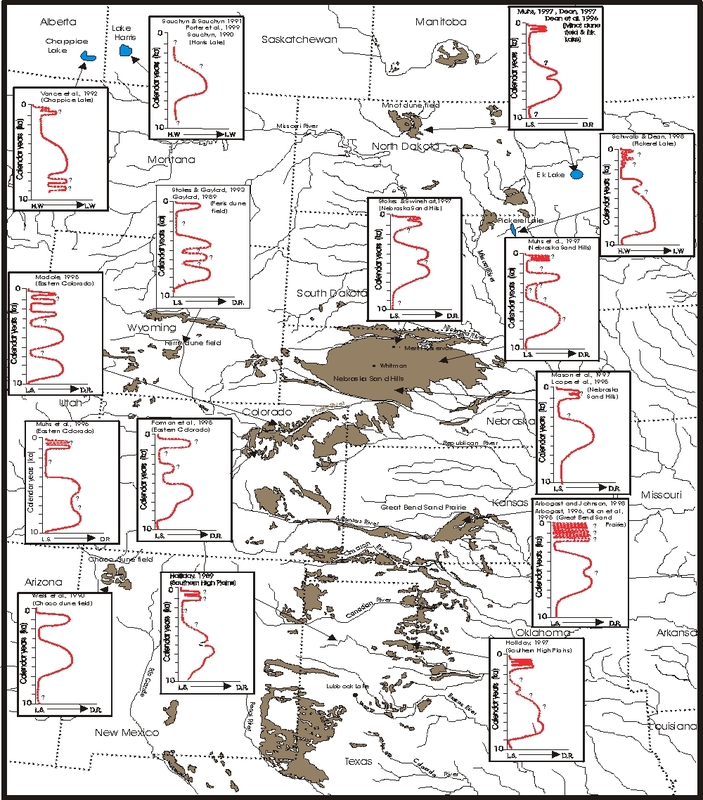 The combination of integrated geomorphic and stratigraphic studies and advances in dating techniques has lead to an enhanced understanding of the timing and location of Holocene (the last 10,000 years) eolian activity on the Great Plains. The data indicate that relatively moist conditions, leading to landscape stability and soil development, were repeatedly interrupted by eolian deposition during periods of drought. Despite the uncertainties associated with the preservation of soil horizons (i.e., the mixing of sediments within a dune) or in correlating dune deposits across the Great Plains, there is regionally consistent evidence for activation of dune systems between 8,000 and 5,000 years ago. Although not as spatially coherent, evidence also indicates the occurrence of a number of drought-related dune formation events in the past 1500 years. The figure to the right […] , from the work of Forman and Munyikwa, shows the spatial distribution and extent of stabilized dune fields (in brown) in the North American Great Plains. Superimposed on this map are 15 time series for the last 10,000 years with evidence for episodes of dry and moist conditions (LS denotes landscape stability, DR denotes dune reactivation. HW denotes high water level, LL denotes low water level). Until we have sand dunes wandering the west, until we have a giant dust bowl that makes the ’30s look like small time drying, any drought is well inside natural variability. This entry was posted in AGW and Weather News Events, AGW Science and Background and tagged drought, Drouth, Global Warming. Bookmark the permalink. Of course, he’s not lyin’, he’s enHansen the truth. Integrity among the catastrophists certainly seems to be suffering a megadrought. A great pity that this has corrupted the practice of science. Reality (truth, God) will ultimately prevail, probably sooner than later. This conquest of democratic governments was assisted by scientists, educators and news reporters who openly promoted items (1-4) of the common interests of ordinary citizens, while their paymasters quietly took away items (5,6). 1. We all want world peace. 2. An end to racism and nationalistic warfare. 3. An end to the threat of mutual nuclear annihilation. 4. Cooperative efforts to protect Earth’s environment and bounty. 5. Governments controlled by the people being governed, including. 6. Transparency and veracity (truth) of information given to the public. That’s The Bottom Line of the current global climate debate. So, to predict the onset of de Vries cycle droughts in North America, all we have to know is when the last de Vries cycle started. That was in 1798 at the beginning of the Dalton Minimum. 210 years after 1798 makes 2008, which happens to be the end of Solar Cycle 23 and the beginning of Solar Cycle 24. Solar activity has been quite weak since 2008, so everything is happening on schedule. Which clearly says we get droughts (in the East / Central USA) due to cooler ocean temperatures…. IRD is Ice Rafted Debris and is the indicator of a Bond Event. Looks like some folks, at least, are still seeing solar variation as important to climate. It’s a sad state where one has to even write a piece like that. Shows that mass hysteria still is very dangerous phenomena. Common sense out of the window in with the hysterics. Proves (again) we are just primates with a superficial layer on top. The hubris of humankind is really totally baseless. And there’s something “Planetary” and “Solar Cyclic -Internal” and “Solar Cyclic – External Near” and “Solar Cyclic – External Mid-Range” and “Solar Cyclic – External Far” and “Galactic Annual” and …. you know, I have a feeling this list goes on forever. It seems there’s a few hundred thousand ripples in time and space that have an effect on us. You really do have to be an idiot, and/or a worthless politician, to say the “Science is Settled!” about much at all. Thanks EM. Thanks again! Great read! Right, but besides that, no “hot event” this century makes it to the top 15 of the past century. We are now all fighting the same tyranny, worldwide. There is, in my opinion, little or no difference between modern-day Communists and Capitalists – Romney and Obama. The “Occupy Wall Street” and “The Teaparty Movement” were both correct, simply viewed from different perspectives. Our first priority is to restore these Constitutional limits on government ! Then, integrity will be automatically restored on government science. The notion that the Tea Party and the “occupy” movement are both “correct” is surprising to me. The Tea Party folks want to protect private property rights. The “occupy” folks would supersede private property with the “needs” of the State — which is to say, them. TP: Government’s minimal job is to protect the lives of all citizens. “ows”: String up the bankers from handy lampposts. TP: The rule of law as crafted in the Constitution and Bill of Rights is worth getting back to. “ows”: No rule of law, as it’s not “fair” that someone should have more than them. TP: Everyone has an opportunity to succeed through work and invention. “ows”: Everyone has a right to live off the government without working. TP: Racism, sexism et cetera have no place in America. “ows”: Racism and sexism are rampant and therefore society and the State must use racist and sexist policies to counter them. TP: Free enterprise creates wealth and prosperity that lifts the world out of poverty. “ows”: Free enterprise is unjust, immoral, and should be taken over by the State. TP: America is a good country at core and deserves to succeed. “ows”: America is the terrorist of the world and deserves to die. I don’t see these as close, but then again I don’t see Romney and Obama as close. The positions of each are similar to the above, except that Romney is squishy and Obama is sly so this is not quite so blatantly obvious. You may be right, Keith. In my opinion an alliance of Communists with Capitalist created today’s world-wide tyrannical government and destroyed the integrity of government science, just as George Orwell correctly predicted in 1948. There’s a distinction to be made, I think, between capitalism and cronyism. To a certain extent, once government has done this you have no choice but to play the game to some degree. This can be done relatively cleanly, but the game itself is the problem and is a creation of the government-created cronyist system. Bain is involved in the game, but plays it fairly straight from what I can tell (compared to, say, Goldman Sachs). Far better to get the government’s nose out of the trough entirely. The lobbyist system will then shrivel to a fraction of its current size — as there would be no profit in it. In a capitalist/free enterprise system, the market decides the value of your contribution, not lobbyists. It’s the shift from “zonal flow” to a more “meridional flow” or “loopy jet stream”. The first leaves the tropical air more tropical and the polar air more polar. The second pulls loops each way. Hot wet air north, cold dry air south. In some cases, southern desert dry air north (like the Mexican desert air giving Texas a drought). So we get excess ‘wet’ in some places while others get excess ‘dry’ from the same process. IMHO, the place where “ows” and TTP have some overlap is that both claim to be populist. One is against “greedy corporations” and thinks government is the answer ( desiring “countervailing force” against the “evil” they do not control). The other is against “greedy government and cronies” and thinks markets are the answer ( via getting ‘self serving force’ away from the “evil” they do not control). The reality is that BOTH large government and monopoly business can be “evil” and beyond the control of the “man in the street” from either group. At one time we had a fairly decent balance point between corporations ( anti-trust and monopoly practices laws) on the one hand and Big Government on the other ( limited government, Senators elected by the States, President appointed, no income tax). I’m not sure they all lined up exactly on the time scale. These things have long cycle times so some non-overlap in implementation doesn’t change the validity). We had what was called the “Mixed Economy”. We also had a glory time of U.S. growth and expansion. Over time the “3rd Way Progressives” moved in. While claiming to be “anti-monopoly”, they really wanted that power for themselves. Leveraging off the abuses of those monopoly and trust operators (see the Pullman Riots as just one example) and using the Great Depression (that arguably they helped to create / deepen) a suite of “Progressive” policies were pushed. Some of these were quite good. Fair treatment of labor ( the real meaning of “fair” not the present political left meaning…) and abolishing practices like price fixing. Europe ran ahead of the USA on that swing of the pendulum and we got Mussolini and the Fascists. Widely hailed as a great leap forward. Mussolini was a Darling Of Hollywood and celebrated in the USA. He was invited to do a cameo in a Hollywood Movie… The trains ran on time. Italy prospered. The “3rd Way” was seen as a fantastic system. Having Government and Corporations in cooperation. Post W.W.II the whole “3rd Way” blend of central planning with crony capitalists had a “bad rap”, so was not to be talked about in polite circles. So periodically the “3rd Way” economics has been revived. It now comes under a dozen different names in a dozen different flavors. If you call it by the original name, fascism, you will be ridiculed and vilified. (Standard Operating Procedure in the propaganda operations of The Left). But call the very same package of policies ( minus the “nationalism” and any hint of “racism”) by a name like “Lange Type Socialism” or “Market Socialism” or “Protective Regulation” or many other names… well, that’s all “modern” and “good”…. The error in this is pretty simple. While there is under performance in an economy, such as after a war or when Monopolists have pretty much tied the thing up in trusts and maximum Monopoly Price at minimum product delivered… you can, in fact, get more productivity out of a central planning operation. Competition does have some costs. Weeding out the “losers” (even if they don’t know they are losers yet…) clears the field for more rapid growth of the survivors / favored ones. Everything does just great. Until enough time passes for the inefficiencies of central planning and monopoly dis-economies of scale to bite. So Stalin had an easy time saying “We need so many megatons of steel! Build steel mills of the present design!”. But central planning did not figure out things like how to invent the Personal Computer, cell phone, iPod, cat-scan, etc. etc. So over time the bloom comes off the rose. Everyone is stuck waiting for someone to die to get a better job and being very much under used producing products that are 20 years out of date. ( Having invested in a Giant Factory with 40 year lifespan, Herr Commissar is NOT going to admit that after 20 years it needs to be scrapped. In capitalism, you go bankrupt and folks take the decision away from you…) Folks end up getting an average share of products from inefficient factories using 20 years out of date methods. You get about 1/2 as much GDP per person (partly from poor efficiency, partly from loads of it going into things like military adventures and junkets). What does that have to do with “ows” and TTP? BOTH see some Fat Cats getting special places at the trough and don’t like it. BOTH are seeing the Average Joe being squashed. BOTH want something done to “fix it”. TTP wants to do it via a return to the “old ways” of limited government and market competition. “ows” wants to do it via a stronger role for “central planning” and bleeding corporations. Zoom out and see the irrigated areas, locally, and of central Washington to our east and south. We live near a stream and riparian zone about 5 miles away. Out temp got almost to 95. Still, a nice warm summer day. Back to James Hansen: My theory is that coal trains rumbled past his bedroom window when he was a child and kept him awake, or maybe later disturbed his mediation or something. He has not been able to stop them even though he has tried hard and gathered many others to his mission. He is now on-in-years and appears ever more desperate in his mission. He has now, apparently, gone silly. Sad for the family, I think. 2.-That water must evaporate before it goes up above as clouds. 4.-Then droughts happen when there is no or little evaporation, when it is cool out there. 5.-“Rain” falls from clouds after these discharge its electrical charge on ground, usually through visible discharges called “lightnings” or through “dark mode” electrical discharge. All this is called “the water cycle”. As cited above, these droughts are common during SOLAR MINIMA and, as noted by William Hershel, wheat prices increase during this solar minima. The many hard working scientists who have done the research where are they? Why are they not drawing the same conclusions as Chiefio? This is something which really disturbs me. The big silence. Not to worry! People are human. We’ll just have to live with that. When the world was flat there were very few Chiefios then too. These guys always seem to be in short supply. The “precursor” event was, IMHO, the book “The Limits To Growth” by Meadows et. al. published in the late ’60s or early ’70s. Promoted by The Club Of Rome (who also bring you AGW Scare) it used computer models to predict Doom In Our Time via running out of basically everything and then preaching that we needed to stop using everything… ( Did you know the world ran out of natural gas in 1980? The computer said so…) Sound familiar? Interesting pattern on that graphic. Wet and dry spots are about 180 degrees out of phase around the planet. Central Russia vs Canada. Australia vs Brazil / S.America. USA vs China. Looks like a simple “what one loses the one on the other side gets”… (With a couple of ‘missing spots’ due to the “mate” being in the middle of the ocean and thus not on the map). Generally, yes. But there is the added bit that during cold PDO phase, we get more ‘meridional’ flow (loopy jet stream). That makes California cold and dry and the US Midwest hot and dry (as the Mexican Desert air wanders up over Texas et. al. instead of wet gulf air / rain). So there are some “which way the loop goes” effects to add in. Like Europe being cold and wet this year from a loop of polar air drooping over them, while Russia was hot and dry from air going the other way. Still, overall, less energy into the ocean surface means less water out of it… so more overall drought. That was a bother to me, too. Until the Climategate Emails showed that the Warmers had a grip on the throat of the Peer Review Process… So not a lot of “There is no warming” papers could be published. There are also a lot more scientists just putting up their complaints in blog form. Now that they know “the review is rigged” they are bypassing it with some of the “issues”. In this case, with the crap paper from Hansen, there’s been a half dozen withering criticisms out in about a week. Hansen and his publisher both looking very foolish.